Happy Earth Day! Hope a part of it is spent out in nature and consuming something that you know originated from the earth. Today I’m thinking about farmers. They’re really the ones most connected to our land, in a way. They depend on it for their livelihood, and so one can assume they understand, respect and value it that much more. And a lot of them, including small-scale cacao farmers, need help in accessing the global market and obtaining a fair price for their beans. Thankfully, there are some savvy, passionate people working on this very dilemma. Some good friends just launched a website today for their project: Yellow Seed. They’ve created a tool that helps connect farmers to buyers and philanthropic donors to facilitate what they’ve coined conscious trade. You can read more about what this means via the Yellow Seed blog. The prototype will be with cacao farmers in Peru, and it launches this summer! Check out the site and spread the word. And sign up for updates and participate! If you know of products or people who are involved in the development of ethical products that could benefit from the Yellow Seed model, please reach out. If you love to travel and eat exotic products and connect with people from all over, then you have a role to play. Consumer choice is a powerful tool for change. The very reason I started this blog was to appeal to chocolate lovers around the world to connect with this product they love and join the movement to demand and expect tasty, ethically grown chocolate. Because chocolate consumption should be a guilt-free experience. And because we are connected to people halfway across the world, whether we choose to believe it or not. And, we all share one earth, so lets invest in the products and methods that nurture it and treat it responsibly. There’s an Earth Day vision I can stand by. 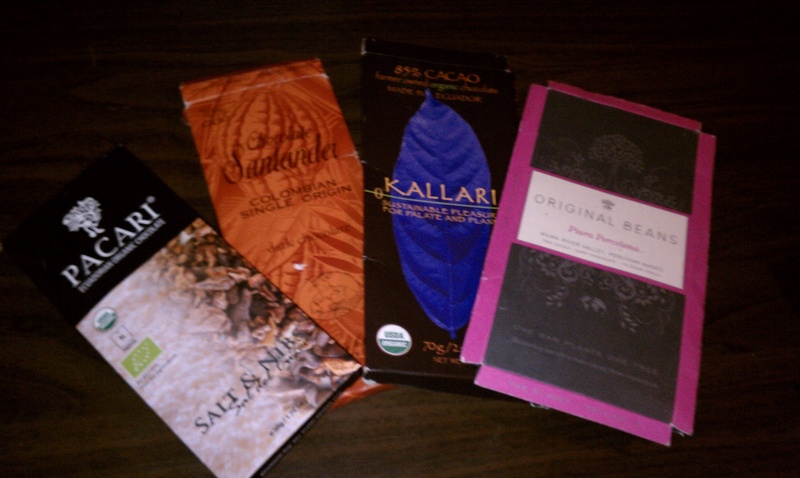 Last year I enjoyed many new artisan chocolate bars and I subjected friends and co-workers to the 5 sense taste test. This year, I’d like to share the stories of these good bars, and the people behind them. And, I want to provide more detail about the benefits of eating this beloved food. It being January, I predict many of you are renewing efforts to maintain or improve your health. Perhaps this includes eating better. For me, eating more chocolate this year to enhance my health and well-being is a priority. This food of the gods, historically used as a medicine and energy booster, is so very good for you. IF what you are ingesting is a pure form chocolate (cacao nibs, natural cocoa powder, or minimally processed bars). It irks me when I hear comments about how chocolate is so unhealthy for us. As I’ve distinguished before, there is good chocolate, and there is mass market chocolate candy (aka impostor chocolate). The former is chock full of benefits. The latter consists of unhealthy and questionable ingredients that may give you cause for concern. So there’s sugar (and we know ingredients are listed in descending order of the amount used). Next up is chocolate…in the “chocolate.” Hmm. Then cocoa butter (ok, counts as a fat additive); cocoa processed with alkali (aka vastly reduced flavanols, or antioxidants); milk fat (potentially damaging to the gut); lactose (oh sugar again, just found in milk); soy lecithin (an emulsifier); PGPR; emulsifier (again), vanillin (artificial vanilla); artificial flavors; milk (lots of milk in this special dark bar). Back up…PGPR? Do you know what that is? I certainly didn’t, so I did some sleuthing. According to Wikipedia, PGPR, aka polyglycerol polyricinoleate, is “a yellowish, viscous liquid composed of polyglycerol esters of polycondensed fatty acids from castor oil. It may also be polyglycerol esters of dimerized fatty acids of soybean oil.” Mmm, as delicious as that sounds, I think I’ll pass. This liquid emulsifier is used to reduce the viscosity of chocolate and is used in Hershey’s chocolate bars to replace much of the more costly natural cocoa butter. In addition to not wanting to eat something that one can’t pronounce, be aware that what you are ingesting here, in short, is a helping of sugar, fat, and artificial inserts. This is why chocolate gets a bad rep.
Now, in contrast, here are the ingredients in Rogue’s Hispaniola dark chocolate bar: COCOA BEANS, SUGAR. This is the food that inspires me. This bar can boast the health benefits that makes chocolate a veritable superfood. It doesn’t even have cocoa butter in it, and it’s a delicious experience. Moreover, one small piece goes a long way. No over-eating. No guilt. 1. Dark, minimally processed chocolate is loaded with naturally occurring antioxidants (polyphenols, epicatechin and flavanols). A cup of hot cocoa contains almost twice as more cancer-fighting antioxidants than a cup of green tea or a glass of red wine. 2. Eating an ounce of dark chocolate (70% minimum cacao mass) a day is good for your heart. It improves blood circulation, and can help reduce high blood pressure and lower levels of bad cholesterol. 3. Cacao nibs are good for your brain and increase mental alertness. 4. Dark chocolate is high in vitamins and minerals, especially magnesium, (important for muscle function and nerve cells), fiber (aids in digestion) and iron (good for red blood cell production). 5. Chocolate makes you happy! It contains anandamide, the “bliss molecule” that sends all those mood boosting vibes straight to your brain, lowers stress and gets you excited. Plus, it tastes good. 6. Chocolate can help control blood sugar, due to its low glycemic index. 7. Chocolate…can help fight tooth decay. For real. There’s a natural extract in cocoa powder that is more effective than fluoride in fighting cavities. So, as an added plug for why we must help promote the growth and preservation of cacao trees, and yes, pay more for good chocolate…think of the lovely benefits to your health! And I repeat, the darker the chocolate, the better it is for you. Embrace the dark side. 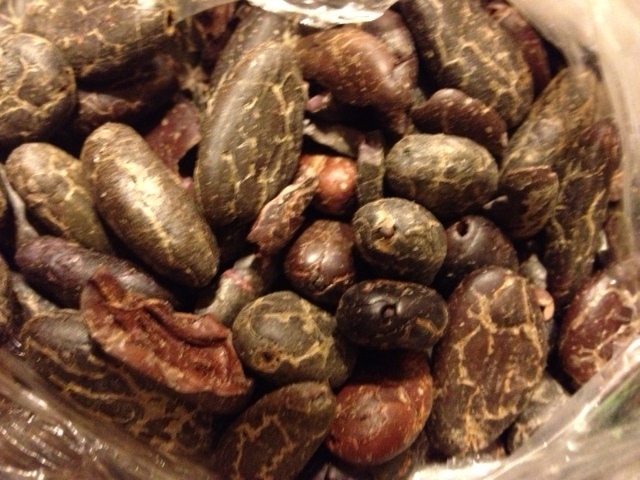 Note that high quality cacao nibs contain the highest health benefits, though they are an acquired taste. There are so many ways to enjoy these bitter gems, and with a gift of cacao beans I received from two dear friends, I will demonstrate ways I enjoy them, in a future post. Please also note that while raw cacao has the highest amount of antioxidants, everything is best enjoyed in moderation. There are apparently two compounds that aren’t so beneficial IF cacao is consumed in very high doses. While I feast on this midnight snack of home-made chocolate cake, cacao nibs, a square of mint chocolate and a piece of plain dark, I’m thinking about what you all will buy today, in terms of chocolate, for the ones you love. I know it’s difficult to think about the ethics of each purchasing decision when you’re out and faced with time and convenience and patience constraints. I ate chocolate cake out at a restaurant this past weekend for my birthday and confess I don’t know where the chocolate was sourced from. I was just hungry for dessert and I didn’t think to ask. It’s hard to be constantly mindful. I get it. And…on a day when many people are thinking about expressing their affections through the purchase of, perhaps, some chocolate, I think there’s a huge opportunity to make an impact and choose this day to CARE. Because he/she’s worth it. Above all, you have the power to choose what to consume. Use it! Will you take the extra step today of looking up a store near you where you can get really delicious, ethically sourced chocolate, and go a step further than just picking up a fair trade bar and calling it good? As you may know, there are amazing bean to bar small batch producers that go beyond fair trade but do not have the certification, because it’s expensive, or for other reasons. And on the flip side, there are some corporations that are able to get certifications just by assuring a minimum percentage of their end product is sourced sustainably. It’s hard to know. But I’ll tell you most of the bars I know and love are not certified fair trade, yet they embody the triple bottom line (people, planet, profit) more than any single certification. So, I’ve done some of the work for you. I know it’s easy to just want to stop by your grocery store or pharmacy to pick up available ‘candy’ but does candy evoke love? I think not. In Seattle, we can buy Theo everywhere (what a relief for the last minute v-day shoppers). As for the rest of the country, and elsewhere in the world, I know not what your options are, but I bet you can find somewhere you can splurge on real chocolate. If just for today. If you must choose this, go for the large companies’ certified lines…like Hershey’s Bliss, Dove’s Promises, Cadbury’s fair trade bars. You can also check out this extensive list from the Food Empowerment Project. They single out mostly vegan companies, and have essentially asked all the listed chocolate companies to disclose where their cocoa is sourced from. I don’t agree it’s as easy as picking a company that is not associated with slave labor, but there are so many companies on this list, it’s worth a look. Happy day of love. Celebrate chocolate today. Real, well-made, responsibly sourced chocolate. It is not as hard as you think. Happy New Year chocolate lovers! As I sit here by the fire, glass of red wine in hand, and a sampling of 75% Madecasse, 70% Agapey from Barbados, and Theo’s newest Pili Pili Congo bar, I am filled with goodwill and good tastes. This chocolate moves me, it causes me to engage my senses – I look, I listen, I touch, l smell, and I take my sweet time allowing the flavors melt in my mouth. I implore you, if you can handle the heat, to go and buy yourself this bar. The story of why the ECI partnership arose is written on the inside. You will learn that cocoa is a high-yield crop that prevents deforestation and can provide a significant source of income and stability in a country that has gone through immense upheaval. Further, this is the type of development model that makes sense. A participatory one where the community that one is trying to help is directly involved in planning their own future. This is sustainable business in action. With the year ahead on my mind, my passion for spreading the word about sustainably sourced and delicious chocolate is ever present in my thoughts. I am curious to learn more about where my chocolate dollars travel, who they impact, how they can be routed to support organizations’ who give a damn about both quality and ethics. Chocolate cannot just save you from a meltdown at work, a bad breakup, a stressful move. It can save families from abject poverty. It can send kids to school instead of out in the fields, wielding machetes that are half their size. It can teach farmers how to efficiently grow cacao trees in a way that nurtures and sustains the earth. It can connect you to people half way around the world, to a product’s origins. And, as I’ll never cease to repeat, it can blow your mind when you taste a well-crafted bar. 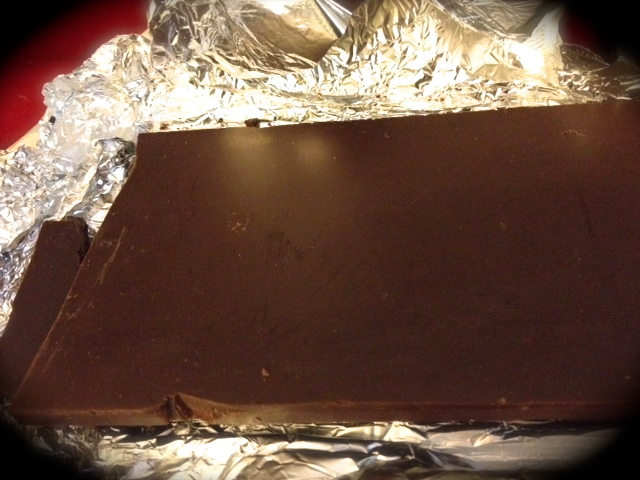 I challenge you to make 2013 the year you try a sustainably sourced chocolate bar you have never had before. I encourage you to learn about the country where the beans in that bar came from and learn about the climate and culture and people there. Heck, maybe this will inspire ideas for your next trip? What chocolate bar has moved you lately? What cause will you move to support this year? In February, I blogged about Hershey’s commitment to work on certifying more of their bars and making real efforts to improve the lives of cocoa farmers in West Africa. A few days ago, the candy conglomerate once again broadcast their continued commitment to addressing (what they now admit to knowing) important issues surrounding the sourcing of their cocoa. Now when I read the announcement that the company has pledged to source 100% certified cocoa for its global product lines by 2020, and help eliminate child labor in their cocoa purchasing countries in West Africa, I was both incredulous, and impressed. Could this really be? Is it green-wash? If not, how is this possible to achieve in 8 years? I dug around a bit. I re-read the announcements and noted the words “global product line” in there. I think this makes the pledge more feasible, if what is being addressed is responsible sourcing to improve their popularity abroad. This does not mean I fault the company for not doing more. It’s a step, a good step, an important step. And it once again proves to me the power of the consumer and this handy item called a scorecard (used to score companies in the same industry to measure their transparency and ethics). Specifically the Australian “Just Act” campaign’s scorecard to very recently call Hershey out on doing the least out of all chocolate companies to address issues of child slavery and labor in a region that produces 70% of the world’s cocoa. Couple that with Whole Foods’ also recent move to remove a Hershey product from their shelf…et voila, you have a new commitment from them. If you just read that and thought, huh? Whole Foods carried Hershey? I never saw Hershey candy bars in the stores…well, you’d be right. What Whole Foods did remove was Scharffen Berger (a well known artisan chocolate bar…that is not so well known for being owned by The Hershey Company). Check out the link above to learn more. I don’t want to remain cynical, but I have to dig deeper when a huge announcement like this comes about. Some questions were raised for me. The company is committing to certifying its global product lines by 2020. This includes the Dagoba line (already RA certified), and Bliss (that they announced in February would be certified this year), and that only leaves…Scharffen Berger. I’ve tried Scharffen Berger bars. The dark chocolate cocoa nibs one is pretty darn good. 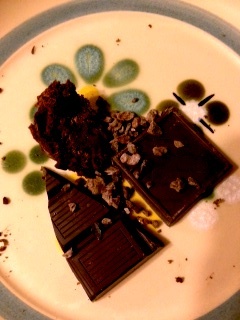 My friend Lynne was brought over to the dark (chocolate) side after biting into a well crafted Scharffen Berger bar. These bars have rich, deep, flavor. The cacao from these bars was, I can with some certainty deduce, NOT sourced from the Ivory Coast (who I believe grow just Forastero varietals). I’m almost positive the ones I’ve tried are from Latin American soil. So to wrap up my very long point, I checked their beautiful site, and saw said country missing from their sourcing list. My point in digging into this is that it appears that the country with the most issues surrounding cocoa sourcing is not where any of the Hershy global product line chocolates get the cocoa for their bars from…. Hmmm. This begs the question: Isn’t there then a high likelihood that their bars sourced from Ghana (the only West African country listed on the site) may already be slave free and therefore not as difficult to certify (for that category)? And is this going to mean concerted efforts to work directly with more farmers in the Ivory Coast to impact their practices? As I’ve mentioned in earlier posts, it’s not a black and white issue, and Hershey, as powerful as it is, cannot be expected to single-handedly solve the government disincentives that make the slave labor issue so prevalent. So, I really do hope and believe their investments in public-private partnerships will slowly, bring about life-altering change, and emulate Milton Hershey’s dream of promoting education, and social and environmental justice. I for one may dig into a SB bar in 2020 to mark this achievement of certification, sustainability and responsibility. I believe change is underway, because of consumer pressure. So we must keep on. The global market raised their voice to move Hershey to raise their bar. And that tells me non-American consumer demand for more ethical chocolate seems to be higher. What about the majority of products, of which are sold in the U.S.? I know customers here care too, so here’s a suggestion…take a look at the company’s site and see if your favorite candy or product is on there. Now ask where those ingredients came from. This weekend marked the 4th annual NW Chocolate Festival. The theme was flavor. And because of its growing popularity, this year’s event was at the Washington State Convention Center, instead of at the Seattle Center. Once the crowd dissipated a bit, I appreciated the layout and was able to roam freely and not battle for a sample, of which there were plenty. Next up, I checked out the multiple artisanal vendors. My favorites included Dandelion chocolate, Madre, Taza, Fresco, Pacari and a vendor that had a salted caramel surprise that melted in my mouth like a ganache. Moving through the workshops, I learned about the C-Spot, the site of Mark Christian, premier reviewer of all the good chocolate out there. Awesome resource! Mark was also on the panel that included chocolate superstars such as Steve DeVries, Chloe-Doutre Roussel (author of “The Chocolate Connoisseur”), Colin Gasko and Art Pederson. Discussions arose around customers’ roles in choosing more sustainably sourced and higher quality chocolate. There is no way the fine chocolate market can cater to the mass market demand that exists, but the opportunity exists to educate customers’ to learn how to develop their palates and seek out more refined bars. The next two panels were my favorite of the day – Nathan Royston of Theo talked about the realities of sourcing chocolate with integrity and high quality in Tanzania. He regaled us with stories of his travel there, and showcased Tanzanian culture in a beautiful way, while revealing the difficulties surrounding doing business in a country where incentives don’t exist to improve the farming quality of the beans. I hope to report more on Theo’s holistic business practices in a future post. Finally, I watched a documentary featuring the story of the Grenada Chocolate Company and its founder, Mott Green. It’s called Nothing Like Chocolate and I recommend everyone watch it. I intend to ask the filmmaker if I can host a screening. For those who have never been to the NW Chocolate Festival, I highly recommend you go next year. This event is not just a chocolate lover’s dream, it’s an event featuring fine, ethical, amazing chocolate. There are important workshops that will teach you about the complex process of making chocolate, panelists discussing the latest trends in the industry, makers who are so passionate about what they do, they’ll inspire you to ask where your chocolate comes from, who it impacts, and more. And it’s fun! And you get samples of the actual fruit of the cacao pod, the cacao bean, and the chocolate. You can view cooking demos and learn how to make truffles. Your mind will be blown, and your palate will be rewarded. Since a year is a while to wait, check out some of the above-mentioned bars at Chocolopolis in Seattle. The owner, Lauren, knows so much about chocolate and will happily recommend some bars. The festival revived my passion for spreading the word about chocolate. 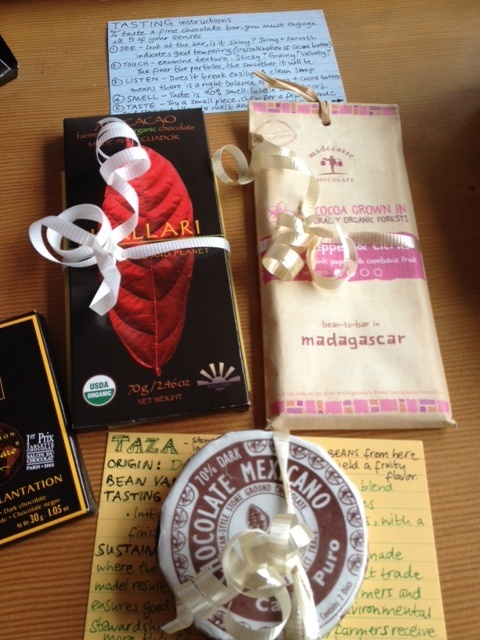 Stay tuned for more stories about these amazing bean to bar and tree to bar chocolate makers! Last year, in the U.S., consumers spent $15.7 million on Valentine’s Day. Some of that was spent on roses. Some on cards. And some on chocolate. I don’t know how much of this was spent on ethical, certified tokens to demonstrate your love, but I’m betting it wasn’t too high. This day does not evoke passion in me the same way eating fine chocolate does. To me, it is a day of contradictions. You are supposed to, on February 14, celebrate being in love, and perhaps demonstrate the depth of your affection through a gift. But if your gift, lets say it is chocolate, has a sullied story beneath it’s fancy wrapping, and if the earth was ravaged and people were harmed in the process of producing this token of your affection, then is your gift as delicious, divine or deep as you had intended? My intent is not to darken the mood around what is a special day for many. It is actually to challenge and suggest that you match the authenticity of your love with a similarly authentic chocolate gift, should you choose to buy one for your partner. Why did chocolate ever become so popular on V-day? Because chocolate, back in the day, when it was revered as gold and consumed as a decadent drink, saved for special occasions and royalty, was truly special. That kind of special does not exist today on most store shelves. But it is out there and it is not hard to find a bar that matches your respect for your partner and the planet, and packs purpose. If you are going to spend the big dollars today for someone, spend it right! Splurge at New Leaf chocolates to support chocolate made right, that’s unique, special, and delicious. Test out Theo for some truffles, Endangered Species to double up your love for your partner and for migratory birds, or elect Equal Exchange. If you’re really looking to indulge, visit your nearest fine chocolate store and purposefully purchase a Kallari bar, some Askinosie, Amedei, Pacari, or Original Beans, a company that embodies quality, meaning, and sustainability. Or go the Divine, Shaman or Camino way. Wow your loved ones with your thoughtfulness in selecting a guilt-free, responsible, high quality chocolate. Because they’re worth it. Hershey expands Responsible Cocoa Campaign…is it really Bliss? Hello readers! I’ve been quite delinquent in posting this last month, and have so much to catch you up on. So, for years advocacy groups have been harping on Hershey to Raise the Bar. Several other large chocolate companies made strides towards sourcing fair trade cocoa or investing in community development initiatives. But mum was the word on Hershey Land. Until now! My friend Sun sent me the news yesterday but I couldn’t get it out in time – Hershey partnered with the Rainforest Alliance on January 30th to certify Hershey’s Bliss line of chocolate bars, which will only have cocoa sourced from RA certified farms by the end of this year. In addition, they have made some long-term commitments to help support the communities in West Africa and take on some real corporate responsibility. This is HUGE. It is the first legit commitment Hershey has made to address responsibility in their cocoa supply chain through use of a third-party certifier. In addition, they have declared a 5 year commitment to invest heavily in the cocoa farmers and families in West Africa that they source most of their cocoa from. They will invest $10 million by 2017 to reduce child labor and improve cocoa supply in West Africa. You read that right. With numerous denials to acknowledge child labor prevalence in the farms they source from in the past, they now seem to be more transparent. I give them credit for this, even if what did it may have been ahem, a little push in the form of a SuperBowl ad threat (which the Intl Labor Rights Forum will desist from now airing) to expose the company’s link to child labor. It worked wonders. What I think is most promising is that in this long-term strategy, cocoa farmers will be given a real chance to sustain themselves. They will receive training to adapt to climate change, and to get more efficient yields, resulting in more revenue. Rainforest Alliance will audit the cocoa farms and use this training to reduce child labor and increase school attendance. Other existing initiatives the company launched was last year’s CocoaLink, a mobile phone project in Ghana meant to send cocoa farmers relevant news about their crops so they can increase farming practices and deal with pests and bad weather. More exciting is that in this second phase, Rainforest Alliance will partner in to provide messages relating to the importance of conservation and climate change. They are doing more work in Ghana through their new Learn to Grow campaign as well. The bottom line is this – Hershey is huge, and after years of inaction, they are finally listening, to consumers and advocacy groups. Which I’m in support of – any step in the right direction, for a company that has such a huge impact, is significant. Lets see how this commitment rolls out. And, for all of you who tend towards the Hershey variety (yes, this may be the first time I promote you buy instead of boycott their bars), go out and get your Bliss on. Hershey needs to know there is demand for ethical chocolate. They have a presence in West Africa to really improve lives, and more importantly, they have the means. AND, the quest for them to improve has only just begun so keep demanding more. Imagine if they were to extend this throughout their company…. Hershey’s Bliss® chocolates are available to U.S. consumers at more than 35,000 retail outlets. These bars will be 100% RA certified later this year. Hot off the press from Daily Mail Reporter yesterday: There will be a shortage of 1 million tons of cocoa within 8 years. With demand growing in places like China, and due to more awareness of the incredible health benefits, there is serious concern that mass market producers will start using “substitutes” to fill up their chocolate bars. This is hardly a viable solution! If an area the size of the Ivory Coast is needed to cultivate more cacao, then what I see is an opportunity to expand across several countries across the Equator that are not yet growing cacao but have the climate to do so. In fact, in the name of promoting shade-grown cacao, perhaps this is just the crop to promote in areas where forests are being cut down to grow a monoculture crop that is decimating the soil. Currently, cocoa is grown in only a handful of countries. If demand grows, my hope is that new farms are cultivated in a sustainable way, maintaining the natural environment. Also hot off the press….the proliferation of the Fair Trade label is deeming it less credible. Apparently in the UK, fair trade chocolates are so much the norm that the label doesn’t serve to differentiate fair trade bars from others. I’m not sure whether to be happy that fair trade is becoming the norm, or worried that it is causing customers to assume certification doesn’t matter anymore. And one last update (not as new) – Fair Trade USA will indeed break ties with FairTrade International at the end of this year as they want to expand the certification to larger companies. Traditionally, Fair Trade certification was set up to help small farmer cooperatives. There is concern by FairTrade International that allowing in large companies (where lets face it, auditing and tracing can be much more difficult) will only serve to water down standards. I think this is a legitimate concern and I am more than wary that FT USA is willing to place its seal on items that have just 10% certified fair trade ingredients! The minimum requirement is 20%. I do see opportunity in increasing Fair Trade certified sales through allowing distribution through large corporations in the U.S. (more market reach is a good thing), however, the standards should not be lowered, or Fair Trade in the U.S. will soon become green wash. The dispute is – did FT USA sell out in search of higher profit margins, or, are they simply trying to scale up Fair Trade’s impact by allowing larger farms and companies to participate?